God's Plan for Triumph Began With a Covenant - History gave birth to one of its greatest moments on that ancient day when God sought out a trusted servant called Abram and placed in his hands a destiny which was designed to change the course of events in heaven and earth. "I Will Bless You" - The lilting promise that Abram heard from the lips of the heavenly Father gave this nomad the right to dream big dreams. A rich inheritance awaited Abram and his seed. "So That You Will Be a Blessing - That which God invested in Abram, God expected Abram to invest in others. No gift was to be hoarded. God promised to bless Abram so that he might be a blessing. Blessings Come in Different Modes and Media - All people are not blessed in the same way. As God endows people with different abilities, talents, interests, and histories, it follows that members of the chosen family became blessings in different ways. "By You All the Families of the Earth Shall Bless Themselves" - Once God had set the wheel of triumph rolling on its way, nothing could stop it. The day would come when the stranged of the earth would be brought back into the waiting arms of a loving God. "Now the Lord said to Abram, 'Go from your country and your kindred and your father's house to the land that I will show you. And I will make of you a great nation, and I will bless you, and make your name great, so that you will be a blessing. I will bless those who bless you, and him who curses you I will curse; and by you all the families of the earth shall bless themselves.'" 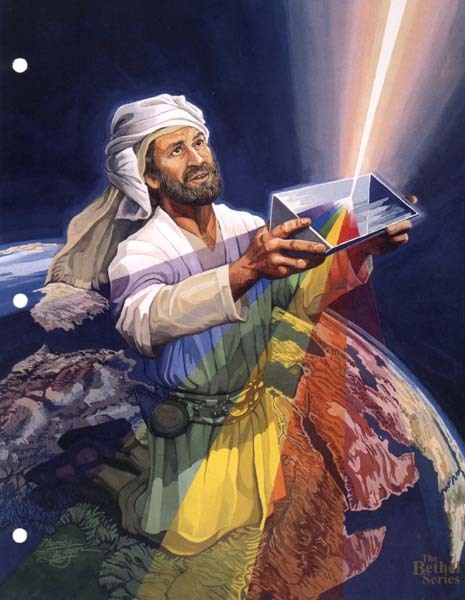 "I will bless you" - Shaft of light strikes prism. "So that you will be a blessing." - Light diffuses and passes through kneeling figure. "By you all the families of the earth shall bless themselves" - Rays of light pass through kneeling figure and extend over the whole earth.